The compact, lightweight R&S®GX460 (AMREC) is a low-power consumption device that is ideal for use in mobile signal interception systems and in combination with the R&S®AMMOS GX400 VXI-based monitoring solution, R&S®CA120 multichannel signal analysis and with most Rohde & Schwarz receivers and direction finders. 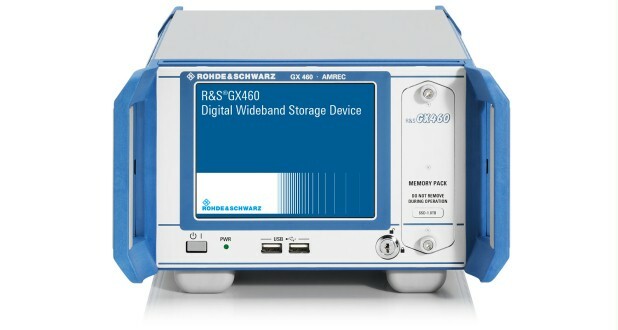 The R&S®GX460 is a lightweight (< 7 kg), low-power (< 100 W) digital wideband storage device. It can be equipped with a DC supply. The R&S®GX460 interfaces with Rohde & Schwarz receivers and direction finders to record and replay signal scenarios. In mobile solutions, the R&S®GX460 can be used to record signal scenarios online at remote locations, for subsequent offline analysis, processing, and archiving at a central station. This ensures that no emissions remain unprocessed or go undetected. Mobile R&S®GX460 devices are configured with a solid state drive to facilitate operation in environments involving high temperatures, shock, vibration, and humidity. R&S®GX460 uses memory packs which can be easily exchanged to facilitate data interchange between stations (e.g. between mobile and fixed stations). The R&S®GX460 is a compact digital data recording and replaying device. 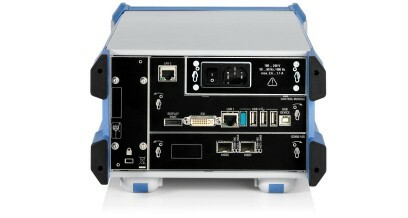 Its format (3 HU, ½ 19") facilitates rackmounting together with Rohde & Schwarz compact receivers, such as the R&S®EB500 monitoring receiver. The stainless steel frame and solid-state storage medium make the R&S®GX460 suitable for operation under the extreme conditions encountered in mobile operations. The storage medium is simple to insert and remove, making it easy to exchange data between mobile and fixed stations. Depending on the configuration and the type of receiver or direction finder used, the R&S®GX460 is able to record scenarios which can be replayed later using the receiver or direction finder. The storage capacity is only limited by the capacity of the storage medium used. A scenario can be replayed repeatedly (loop mode). With a 1 Gbit Ethernet interface, the R&S®GX460 can be used for recording and replaying scenarios with a bandwidth of up to 10 MHz and for controlling the device. 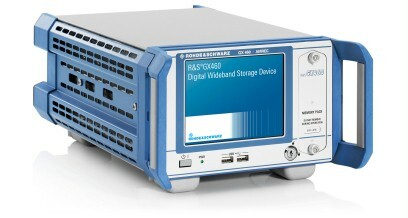 Additionally, the R&S®GX460 can be configured with the following: 10[[mbsp]]Gbit Ethernet (either electrical or optical), data transfer for the R&S®ESMD or R&S®DDF255; the maximum data transfer is sufficient to handle scenarios with up to 40 MHz bandwidth, see table "Interface with products from Rohde & Schwarz". 1) Only available with the R&S®GX460-SSD option.